Historic 25th Street Business Association presents the tenth annual America First Credit Union Harvest Moon Celebration. 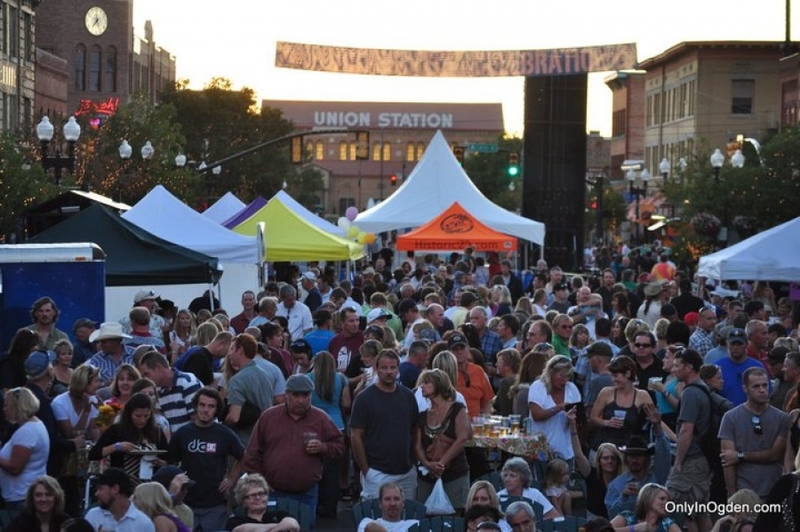 One of Utah's largest outdoor celebrations will take place on September 24, 2011 from noon until 10 p.m. The community will celebrate the end of summer, KBER's 25th anniversary and the XTERRA USA Championships and Trail Run Nationals in Ogden. More than 25 family-friendly activities are planned for all ages including live music, kid's activities and downtown criterium races. "Community members, families and athletes alike will gather for a weekend full of summer's final activities," said Heidi Harwood, special event coordinator for Historic 25th Street Business Association. "We anticipate more than 10,000 people will join us to celebrate KBER's anniversary, the XTERRA National Championships and our community's unique outdoor activities and settings." New this year the Association will partner with KBER for a joint anniversary celebration, Harvest Moon's 10th and KBER's 25th anniversary. To mark their 25th anniversary KBER will host the winners of the anticipated Battle of the Bands competition during the Harvest Moon Celebration. The winners will have the opportunity to open for the event's headliner "Old Californio" that evening. KBER and the Golden Spike Harley of Riverdale will also give away a Harley by holding a "Hog your Seat" contest where participants will play 101 musical chairs for the prize. Free kid's activities will take place from noon until 5 p.m. Activities include pumpkin painting, spray on tattoos, balloon art, a bubble pad and many more. Community partners such as the George S. Eccles Dinosaur Park, the Eccles Community Art Center, Weber Pathways, the Tree House Children's Museum and Ogden City Firefighters will provide activities. The 25th Street restaurants will take their offerings to the street including Tona, Bistro 258, Union Grill, Roosters, Rovali's, Two Bit Street Café, jásoh!, Café Mergot, La Ferrovia, Athenian, Crowley Café and 360 Café. Snow cones and snack food will also be offered. Beer and wine services will be available. Other activities during the celebration include the Ogden Farmer's Market and free admission into Union Station Museums. It will be the last market of the season and vendors will begin at 8 a.m. and remain open through out the day. Local and national performers will continually fill two stages on 25th Street from noon until 9:30 p.m. A Hope Walk to raise awareness and prevention of suicide will take place during the event. The Hope Walk begins at 10 a.m. Harvest Moon Celebration will occur in conjunction with the XTERRA USA Championships and Trail Run Nationals. World-class athletes will be in attendance during the event. A presentation featuring highlights and honoring the XTERRA champions will transpire at approximately 8:30 p.m. at the big stage. Sponsors of the Harvest Moon celebration are America First, KBER, Golden Spike Harley, Downtown Ogden Inc., Historic 25th Street Business Association, RAMP, Budweiser, Miller Coors, Coca-Cola, Sam's Club and Hampton Inn. For additional information visit www.historic25.com or call 801.644.4068.